How To Get Rid Of Groundhogs? Home Diseases And Pests How To Get Rid Of Groundhogs? If you’ve seen the movie Groundhog Day you probably have a bit of a soft spot for Bill Murray’s furry co-star. That’s understandable – groundhogs, which you might know as woodchucks or whistlepigs depending on where you live, are pretty cute little guys. Then again, if you have a vegetable garden you might not agree – and they’re not very popular with farmers, either. Groundhogs are a species of marmot, a kind of large ground squirrel. Unlike other marmots they’re good swimmers, and can also climb trees to escape from predators, but apart from their climbing habit they’re not much like normal squirrels. They have chunky bodies, weighing anywhere from four to 31 pounds – they’re larger in areas where alfalfa is grown and there aren’t many predators – and short tails. They also have powerful paws, because they like to dig. Digging is one reason groundhogs can be a nuisance. They live in burrows, which average about 14 feet long but can be over three times that, with large underground sleeping chambers. Groundhogs also hibernate through winter and they usually dig a new burrow in late fall instead of sleeping in their summer one. A groundhog will excavate about 35 cubic feet of earth for each burrow – sometimes much more – so if you have a big enough local population the ground can get badly undermined. Farm ponds are commonly damaged, building foundations can be weakened and it’s not unknown for the ground to suddenly collapse under a tractor as the hidden burrows cave in. Groundhogs also have prodigious appetites, and they’re fond of vegetables. Crops like alfalfa are their favorites but they’ll eat pretty much anything edible, so your vegetable plot is a prime target. You’ll find them to be a persistent pest too – they don’t give up easily, and thanks to their digging ability they’ll just go under a fence that would deter most critters. As cute as they look, if you have groundhogs on your property you’re going to have to get rid of them. The most humane way to solve a groundhog problem is to make your yard unattractive to them so they won’t hang around. The good news is they’re not all that social, so you’re probably not going to find dozens of them, and while one or two can be destructive the small numbers in the average area make them easier to control. Groundhogs are a favorite meal for a lot of predators, including wolves, coyotes, mountain lions, bobcats and eagles. That makes them pretty nervous when they venture out in the open, so like most small animals they prefer to stay under cover as much as possible. Keep grass short, and cut back low vegetation to deny them shelter. They’re likely to decide your yard is too dangerous and stay away. You can also install some visual deterrents – anything that moves will do, because they’re naturally timid animals. Try sticking some pinwheels in the ground; that often frightens groundhogs and other critters. If you want to get more technical, motion-activated lights or noisemakers – even sprinklers – can be effective. You can also buy chemical animal repellants, including a few billed as being effective against groundhogs. Do they work? Reports are mixed, but tend to the negative. Some small animals are scared off by the smell of these substances – which are usually based on predator urine – but groundhogs don’t seem to be. They also ignore ultrasound devices, so if you’re trying to frighten them off stick with visual threats and audible sounds. If the main problem is your vegetables being eaten, a fence is the simplest method. Yes, they can dig, but if you get some two-inch chicken wire you can build a barrier that will keep them out. Dig an eighteen-inch deep trench round your vegetable plot, build the fence at the bottom of it then backfill the soil to ground level. Make sure there’s about two feet of wire above ground to prevent them climbing, and your crop should be secure. 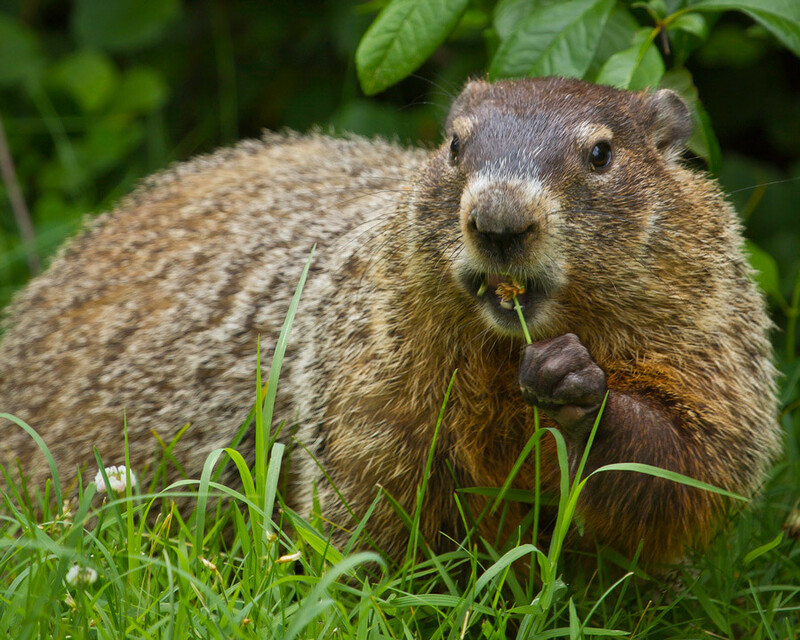 Groundhogs digging burrows under your home is a more serious issue; the disturbed earth can cause real trouble for your foundations, and if the house is on timber piles they’re likely to get gnawed. Groundhogs are rodents, so their teeth grow constantly and they’re always chewing on stuff to wear them down. They can do an incredible amount of damage to anything made of wood and, if they’re under your home, getting them out is a priority. There are some folk remedies that are supposed to drive them away, including stuffing ammonia-soaked rags down their burrows, but no evidence that any of them work. The best solution here is to trap the animals. You can use lethal traps but these are also a serious danger to pets and children, so go for a live trap if possible. Wash the trap with unscented soap, or leave it out to weather for a few days, then handle it with gloves on – your scent will frighten groundhogs away from it. Bait the trap with broccoli or fresh corn then leave it near the entrance to the burrow and check it every day. When you catch a groundhog, be careful. Despite their cuddly appearance they can be aggressive, and they have sharp teeth. There’s also a risk of rabies. In areas where raccoons are the main carriers groundhogs often get infected – and they can transmit it to you with a bite. Don’t mess around with a trapped groundhog. If it looks ill and confused, contact your local animal control and get them to check it out. If it seems healthy load the trap into your car and drive at least five miles away. Find the edge of a wood or some open grassland – not somebody’s field – then open the trap, stand back and let the groundhog escape. That should be the last you see of it. In extreme cases you might have to kill groundhogs. The most humane way is shooting, but this isn’t always possible. Alternatively they can be gassed in their burrows with carbon monoxide cartridges or aluminum phosphide pellets – but don’t do this if the burrow is under your home; dangerous gas can escape into the property. In general lethal control is a last resort and you should avoid it if possible, although it’s legal to kill groundhogs in most states. Generally, live trapping will be enough to see them off. Not legal in some states, including NY, to trap them. eyed susans. I think he is under my deck.